Xposed framework is now available for Android 6.0 Marshmallow Devices, these Best Xposed framework modules will help you with customizing your Android experience. Most people rely on Custom ROM to improvise performance, get new features or refresh User Interface. There are other ways to achieve the same. If you have not rooted your device, then Customizing Android using Launchers, icon packs and Fonts is easy. Once you root your device you get much deeper access to the system and can customize almost everything, you can remove pre-installed apps, add new settings and functionalities, Overclock processor and other resources. Xposed Framework is a great way to customize Android and add new functionalities without much risk of bricking or security. 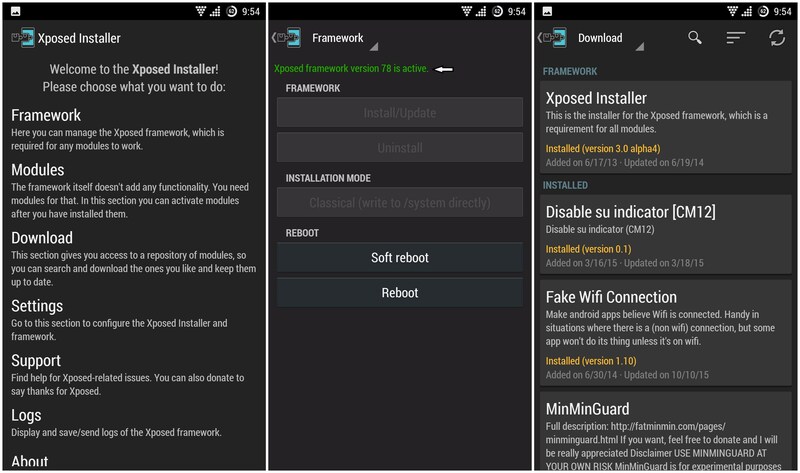 Xposed Framework is supported by all 4.1+ Android versions. 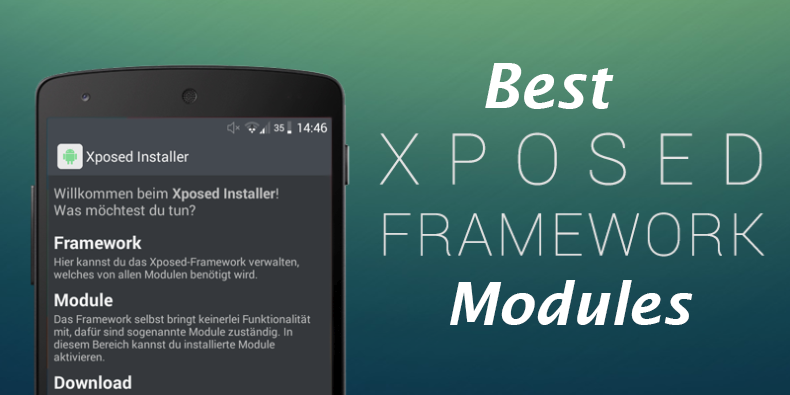 Xposed framework modules are the best ways to changes your system level without any messing with codes or custom ROMs. It directly plugs into the Android OS to give complete control over the look and appearance of the device. All the changes can be reset to default settings if you disable these modules. We tried many modules on our Nexus Marshmallow device so that we can put the best Xposed frameworks for Marshmallow Android devices on this page. Almost every part of the framework can be tweaked using this mode. If you are really offended due to low battery life after updating to Lollipop/Marshmallow, then Amplify Battery Extender is your best solution. It actually controls how your device can wake up and how long can stay awake. It is highly recommended for battery savings, customize every alarm and wake locks on your device. It is really a great solution for you if you really have a quick battery drain problem. Awesome pop-up Video is an amazing video player that can play the video in a pop-up square window floating on other apps window. It is similar to YouTube pop-up window which floats and plays the video even if you are busy in searching others. It is a must for tablets for wider screens. It is not only a pop-up player, when you are finished with your multitasking, you can definitely enjoy your videos with no distractions. It has a 5-minute viewing limit but you can upgrade to pro version to remove this limit. Supports playlists and a special eye candy for Xposed framework users. A great Search-easy way for searching videos easily. First Row tab: It is a one tap stop hub for getting the trending videos. Supports Chromecast: For external videos. Custom Themes: You can customize your player to match your player to match your phone’s theme. You can hide videos except the one from YouTube. Snap Edges: When the player lies to any nearest screen edge, then it automatically snaps right to its edge. It is an amazing app for multitasking people who really wants to do multiple tasks simultaneously which includes watching videos. SwipeBack is a global swipe gesture tool to make the android interface easier to navigate. It replaces the need to tap the back button to go to the previous page. In other words, it acts as an Android library which finishes any activity using gestures. You can customize the swipe directions to left, right, top and bottom. If you are frustrated with using the back buttons for numerous times consistently to back many pages, then SwipeBack can make your navigation easier. XPrivacy is the best module to avoid those programs which drip delicate and private information. It is used to limit the amount of information any app can access. There is various private information which must be limited to others like Contacts and locations. If you limit the data to be accessed then it sends vacant info back to the program. It doesn’t revoke any authorization from a program. If you launch the XPrivacy, then you can easily manage the limited data that others to access. 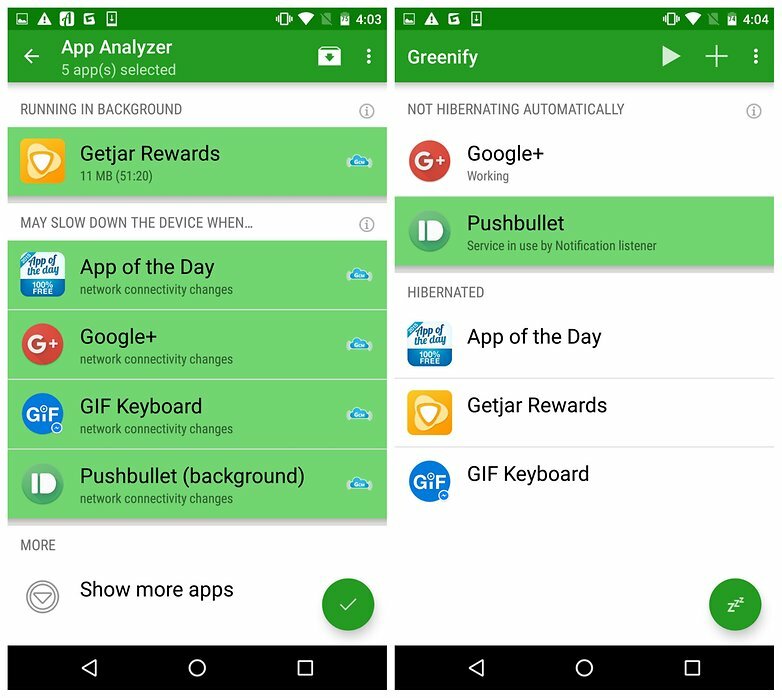 Greenify simply force stop those apps which drain out device’s battery. It shows you the battery draining apps and the apps which have already been forced to hibernate. It is not must to root your device for using Greenify. Go to the App Analyzer page. Select the apps you want to greenify. Check mark at the upper right corner. Click on “Create Hibernation Shortcut” to hibernate. Click on “Hibernate Now” button. A pop-up appears which asks you to “Force Stop”. Using Greenify and Amplify, you can save your battery up to a great extent. It is a Xposed Framework module used for theming your Status and Navigation Bars. With few clicks, you can easily customize your Status and Navigation Bar in your favorite ROM like a child’s play. It works only on rooted device enrolled with the Xposed framework. Adjust the selected icons to theme. You can choose which icons to theme. Customize the background, scales and various buttons color with amazing themes. It is the first multiboot application of Android. Most of the apps take your system libraries and resources to load themselves whenever the device boots. These apps automatically start with your system booting which lengthens your booting time and decreases the overall performance. You can install and boot ROMs from the SD Card and can boot between them with just a reboot option. This ultimately acts as a recovery module for your SD Card slots. You can install kernels, custom ROMs and themes. You can use the normal recovery mode for your device ROM only. It acts as a smart task killer and keeps the less used apps pause until you need them. It automatically monitors the permissions of all the apps regularly. Enable the BootManager module and reboot the device. An alphabetical list appears which displays all the installed apps. Touch the app you want to exclude from system startup. You can customize more options on the Settings menu such as Fast Booting; don’t block any app and much more. This module adds a major functionality to Instagram. Using the basic mode, you can add a small zoom button at the right corner of the comment button. You can also directly share the zoom button under each photo in Instagram. To open the image in full-screen mode for zooming the image, click the zoom button. You can save to phone storage. 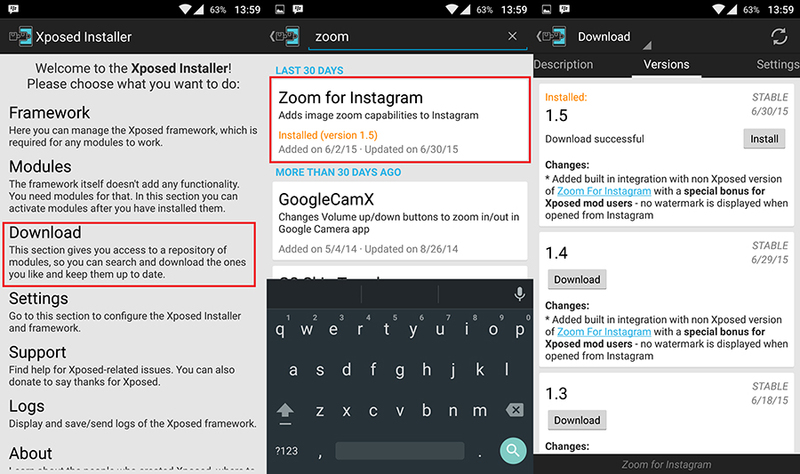 It gives a special bonus for the Xposed mod users that no watermark will be displayed if it opens from Instagram. The most annoying thing about YouTube is that it doesn’t allow background play. If you are watching any video on YouTube and suddenly turns to another app, then the video gets paused. This module gives the most awaited functionality of non-stop audio streaming music app. As the name signifies, this app enables background playback in the official app. It doesn’t have any user interface hence, there is nothing that we can customize in this module. It is a simple and fair module which only activates in the Xposed framework. We would love to know your experience with these modules. Please feel free to tell us about any module you love and want to add to this list.